Jerusalem—Updated from April 2004 – March 27, 2018 …. It was 16 years ago and the days before Passover in Israel were no different than today. With only three differences. Iran is closer to acquiring a nuclear weapon. US President Barack Obama, who has not missed an opportunity to attack Israel and it’s Prime Minister, was allowing Iran to acquire a nuclear weapon. Today, President Trump says he is moving the US embassy from Tel Aviv to Jerusalem. 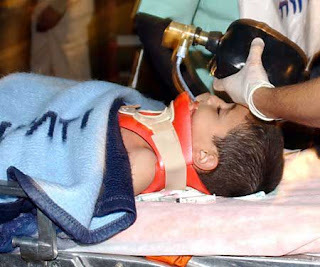 An Israeli child struggles for his life. Obama was also demanding that Israel withdraw to suicidal 1967 borders. To make peace with Palestinians (Hamas) who have turned down every peace offer made to them. To make peace with those who gave us the Passover Massacre. My new born daughter Amanda and I had just arrived at my in-law’s home for Passover dinner in Netanya. As we stood around the carpeted living room sharing compliments and jokes as last minute Passover table preparations were being made, we heard a crack of thunder. This was not unusual. There was a slight drizzle coming down as we parked the car minutes earlier. Thunder storms are still generous in Israel’s March before we enter the seven months of endless days of sun. Then we heard an ambulance siren. Again nothing usual about that either, there are an abundance of nursing homes mixed in with the hotels marking Netanya’s tranquil seafront. A second and third siren screamed passed our building. The TV was turned on and we heard the first reports of what is known today as the Passover Massacre. 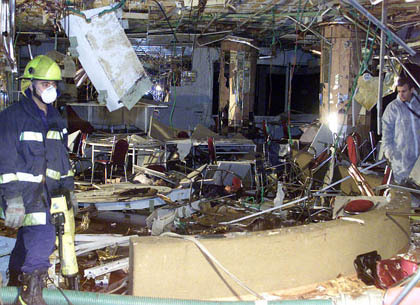 In one of the most brutal terror attacks sustained by Israel, an Islamic suicide terror bomber from the Hamas terrorist organization walked into Netanya’s Park Hotel on March 27, 2002. He strode passed the reception desk and calmly walked into the main dining hall. As elderly Jews and children were sitting over matza and chicken soup, the terrorist detonated a lethal charge, murdering 30, and wounding 140.The dead included babies, grandmothers and six married couples. It was 7:30 p.m. and I had to make a judgment call, leave my family at the start of this festive family meal or cover another terror attack in Israel. I struggled with the decision, my family kept saying don’t go. But I really had no choice. When I arrived on the scene, which was two blocks away, there were about a dozen ambulances caring for the wounded. Five dismembered and blood soaked bodies lay covered with blue and grey blankets outside on the hotel’s sidewalk. Many of the guests who had survived the terror attack and were being rushed to nearby hospitals were still dressed in their holiday best; the women in festive dresses, the men in white shirts and dark pants. Shreds of glass were sprinkled throughout the ground. The hotel lobby and the second floor of the hotel had all of its windows blown out. The only thing moving were the torn, white window curtains twisting in the cool wind. A large pool of water created by the hotel’s safety sprinkler system and broken water pipes filled the reception area. But this was not ground zero – broken glass and water were only a prelude to the horror which was about 50 feet passed the front desk, the burned and blood stained remains of a festive Passover dining room. White tables and chairs were thrown several feet into the air, landing against the hotel wall. Unopened bottles of Passover wine and colorful flowers now littered the floor. An eerie, death filled quiet had settled in where moments before there was laughter, life and hope. People were slowly walking out of the hotel in a silent daze, all frozen in shock. One elderly man walked slowly down the street with no apparent direction wearing a blue dress suit with blood spilling out of his grey hair. “I saw little children, bodies. And I want to say something to the Arab leaders in Beirut. This is not resistance. This is murder. This is terrorism it’s most purest form,” Netanya Mayor Miriam Feyerberg told the TV cameras. Among the dead and wounded in the bombing were entire families, Israelis and foreign Jews visiting from abroad for the holiday. The force of the blast devastated the dining hall, knocked down the facade of the hotel lobby, shredded the paneled ceiling inside and crumpled cars parked on the street outside. Nichama Donenhirsch, a guest at the hotel, said that as she and her family fled, they saw a little girl, about 10 to 12 years old, lying dead on the ground, her eyes wide open as if in surprise. Some of the wounded staggered out of the lobby, which was plunged into darkness by the explosion. Others were taken to ambulances in stretchers, including a young boy who had an oxygen mask pressed to the face. One elderly man was covered by a blue blanket, blood dripping from his face. An elderly woman, her face covered with blood, sat on the sidewalk, attended to by several people. The Park Hotel is located directly opposite the city square and on a hill overlooking the beach. There are several other hotels in this residential area of Netanya. The mutilated bodies of murdered Israel men, women and children, who minutes earlier were celebrating a Passover meal, lay lined up outside the Park Hotel in Netanya. As police arrived they started to create a perimeter, a safety area as police sappers began searching for additional explosives. About one hour after the attack took place, Israeli security forces discovered that explosives had been placed inside one of the many ambulances at the scene. Immediately all of the ambulances and rescue workers were evacuated. Mayor Miriam Feyerberg spoke with me and stated that Israelis must remain strong. That we all must continue with our lives, go to work, continue shopping, visit restaurants, otherwise the terrorists would win. resistance’, but resistance is not blowing up children and babies,” Feyerberg said. When the bomb exploded tonight, the Mayor had been attending a Seder – with mothers of the victims of last summer’s (2001) terror bombing in Tel Aviv. Over 62 people were rushed to Laniado Hospital, 15 in serious condition among them a 45-year-old man and a 5-year-old boy, both with head injuries, who were later moved from Laniado to Beilinson Hospital in the Tel Aviv suburb of Petah Tikva. Hospitals were overwhelmed, setting up triage in their synagogues and shuffling the less seriously wounded to their cafeterias. As is usually the case, the bomb contained nails and other metal pieces to enhance its lethal effect. Another 33 of the injured were taken to Meir Hospital in Kava Sava, two of them in serious condition. to rein in terrorists. Raanan Gissin, a Sharon adviser, said the attack in Netanya “will require us to reevaluate our overall policy. We are still working to achieve a cease-fire to which we are fully committed, but if the Palestinians have decided to choose the road of terrorism … then we have to decide what measures we will take,” Gissin said. Secretary of State Colin Powell had urged Arafat to go on television and demand an end to terror attacks against Israelis. The attacks endanger any negotiations toward a Palestinian state, Powell said. “This sort of activity and the tolerance of this sort of activity will destroy the very vision the Palestinian Authority stands for and Chairman Arafat says he’s committed to,” Powell said in Washington. The 2002 massacre in Netanya came just hours after Saudi Crown Prince Abdullah presented a new peace initiative at the Arab summit in Beirut, offering Israel normal relations with the Arab world in exchange for a complete withdrawal from the territories it occupied in the 1967 Mideast war. Israeli police had been on high alert for possible attacks during the Passover holiday, with more than 10,000 officers deployed in potential trouble spots. Police and IDF roadblocks had been set up throughout the country with increased patrols within both commercial and residential areas after the Passover Massacre. The mood in Israel had turned from festive Passover joy to depression and anger. Many Israelis who once held out hopes that a breakthrough peace agreement might still be within reach, were eating matzah in March 2002 with salt in a more realistic and pragmatic environment. It takes two willing parties to negotiate a peace agreement and Israelis have no plans to make a second Exodus here in the Middle-East. After the Passover Massacre bombing, President Bush called on Arafat once again to do all in his power to stop the escalating cycle of bloodshed. “This callous, this cold-blooded killing must stop. I condemn it in the strongest terms. I call upon Arafat and the Palestinian Authority to do everything in their power to stop the terrorist killing because there are people in the Middle East who would rather kill than have peace,” Bush said during a stop in Atlanta. bombing at a Jerusalem shopping mall that killed two and injured more than 60. If Hamas, Hezbolah, Islamic Jihad and Fatah believe that they can wear down the Israeli people – then don’t know the Israeli Sabra and his resolve. As Americans became stronger after September 11th, Israelis have also closed political and religious ranks and prepared for measures which will prevent future terror attacks. Those measures in the Spring of 2002 took the form of the IDF’s Operation Defensive Shield. cabinet session that the closure imposed on Judea, Samaria and the Gaza Strip will last until after Independence Day. Mofaz added that security authorities have decided on a series of preventative measures to thwart terror attacks, including increased pressure on terror hubs, particularly in Nablus. The army and security services have once again gone on high alert in anticipation of the Passover holidays. Defense sources report 50 warnings of possible terrorist attacks, some in revenge for the assassination of Hamas leader Sheikh Ahmed Yassin two weeks ago. The IDF has imposed a closure on the Gaza Strip for the duration of the holiday. The Israeli border passes at Karni and Erez have closed down to workers, but will enable the passage of merchandise. The Erez industrial park will continue operating during the holiday. Authorities repeat that all humanitarian aid will continue to flow into the West Bank and Gaza. Thousands of policemen, border police, IDF troops and civil guard volunteers will safeguard the borders, entertainment places and recreation sites over the holiday. Security in synagogues, hotels and West Bank settlements will also be beefed up with troops and technological auxiliaries. Israeli police are beefing up security in shopping malls, market places and other crowded places. Police also intend to set up more road barriers and intensify its search for illegal Palestinian workers. The Passover Massacre did not take place in Washington or Moscow. Israel in it’s war against terrorism, killed Hamas master terrorist Achmed Yassin. Yassin was responsible for the murders of 377 Israelis in at least 425 terrorist attacks over the past three-and-a-half years of the Palestinian Authority’s war against Israel. 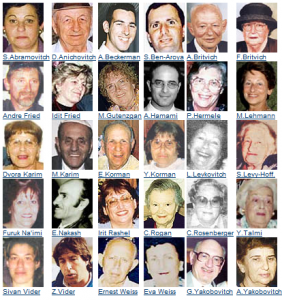 Among the most devastating attacks Hamas claimed responsibility for the Park Hotel Passover Massacre in Netanya on March 27, 2002; 29 killed, a suicide bombing of the number 2 bus coming from Jerusalem’s Western Wall on Aug. 19, 2003; 23 killed, including three children and two babies; a suicide bombing at the Dolphinarium discotheque in Tel Aviv on June 1, 2001; 22 killed, mostly teens; a suicide bombing of Sbarro’s in Jerusalem on Aug. 9, 2001; 15 killed, including five members of the same family – three children and their parents; a suicide bombing of the Matza restaurant in Haifa on March 31, 2002; 15 killed, including two fathers each with his two children and the list goes on. We must now remember – it’s not.